Hand pain may or may not be the first sign you experience before an impending hand injury. Sometimes you may experience hand fatigue numbness or tingling as a first warning and if you are careful to pay attention to your body you may be able to avert a hand injury. As a jeweler or a crafts-person you are constantly working in positions that can compromise posture and repeat taxing motions. Working for multiple hours in the same position can lead to hand injuries such as RSI (repetitive strain Injury), carpal tunnel syndrome, and a variety of tendinitis issues. 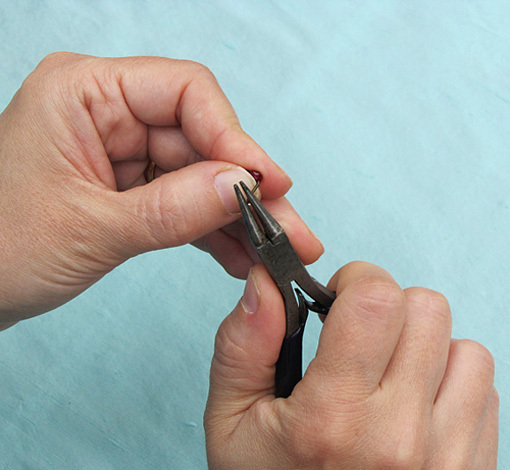 Most of us do not know the potential for hand injuries when making jewelry until, unfortunately, we experience hand pain. As someone with vast experience regarding hand injuries, as well as a host of other job related injuries I would like to share with you the many tips and suggestions I have learned along the way. Your hands are your livelihood and the tools you need in order to live your passion. This puts protecting your hands at the top on your list of priorities. 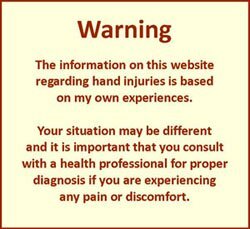 You have found this page either because you are having pain or you are concerned about hand injuries. I have divided this section of the website into two parts. The first part will cover how to prevent RSI Carpal Tunnel Syndrome and Tendinitis. In the second part of this section I will cover Treatment for Carpal Tunnel, Tendinitis and RSI. Please know that I am not a Doctor or a physical therapist and it is of vital importance that you seek medical attention for any hand pain or hand injuries. Repetitive Strain Injury is basically an injury of the muscles and nerves caused by the repetition of movements, the application of too much pressure over exertion, working with too much vibration or working for long periods in compromised positions. This is one of the most common hand injuries where the muscles and nerves are weakened and challenged by the strain of repetitive and taxing work. An example of this would be: working for extended periods on small detail oriented tasks or working for long periods on the computer. Carpal tunnel syndrome occurs when the median nerve that runs along the forearm to the palm is squeezed or pressed at the wrist. The tendons that run through the carpal tunnel become swollen and the swelling puts pressure on the median nerve. As a result you can experience numbness and tingling in the thumb, index finger and middle fingers. Carpal tunnel can also cause pain and weakness making it difficult to perform tasks and sometimes causing loss of grip. For example: a common complaint from waitresses who suffer from carpal tunnel hand injuries is the inability to hold things such as a coffee pot and having objects drop out of their hands. Tendinitis is an injury that involves the inflammation of a tendon. Examples of tendinitis are: tennis elbow, wrist tendinitis and shoulder tendinitis. A tendinitis hand injury is usually caused by repetitive motions sustained for long periods of time as well as undue stress on the tendons. These are the three most common hand injuries associated with making jewelry. If you would like to learn more about how to prevent hand injuries please click on how to prevent RSI, carpal tunnel and tendinitis. If you are experiencing hand pain, wrist pain or tingling and numbness please make sure to consult with your health practitioner. To learn more about ways to treat hand injuries please click on treatment for carpal tunnel, tendinitis and RSI.